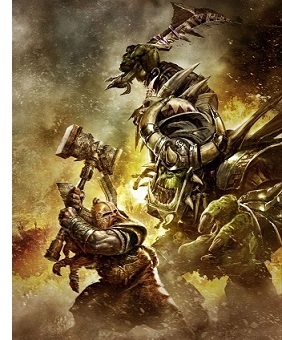 War of Dwarves and Orcs (2790-2799 T.A.) - After Smaug captured Erebor, King Thrór, returned to Moria in hopes of making the old Dwarven hall their home once again. But he was killed by the Orcs who had taken up residence there, and that set off a great war. "That was the beginning of the War of the Dwarves and the Orcs, which was long and deadly, and fought for the most part in deep places beneath the earth. Thráin at once sent messengers bearing the tale, north, east, and west; but it was three years before the Dwarves had mustered their strength. Durin's Folk gathered all their host, and they were joined by great forces sent from the houses of other Fathers; for this dishonour to the heir of the Elders of their race filled them with wrath. When all was ready they assailed and sacked one by one all the strongholds of the Orcs that they could from Gundabad to the Gladden. Both sides were pitiless and there was death and cruel deeds by dark and by light. But the Dwarves had the victory through their strength, and their matchless weapons, and the fire of their anger, as they hunted for Azog in every den under mountain. At last all the Orcs that fled before them were gathered in Moria, and the Dwarf-host in pursuit came to Azanulbizar. That was a great vale that lay between the arms of the mountains about the lake of Kheled-zâram and had been of old part of the kingdom of Khazad-dûm. When the Dwarves saw the gate of their ancient mansions upon the hill-side they sent up a great shout like thunder in the valley. But a great host of foes was arrayed on the slopes above them, and out of the gates poured a multitude of Orcs that had been held back by Azog for the last need. 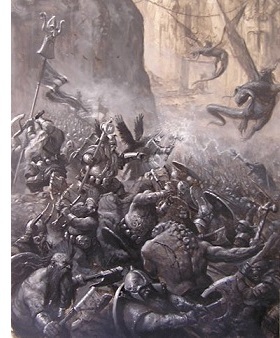 At first fortune was against the Dwarves; for it was a dark day of winter without sun, and the Orcs did not waver, and they outnumbered their enemies and had the higher ground. So began the Battle of Azanulbizar (or Nanduhirion in the Elvish tongue), at the memory of which the Orcs still shudder and the Dwarves weep.